From Faith: As soon as there is a whisper of coolness in the autumn air, our chief cocktail contributor Anthony DeSerio starts thinking about “brown spirits,” meaning any barrel aged spirit like rum, tequila, or whiskey. He’s dreaming about vanilla, oak, caramel and toffee this time of year, the perfect array of flavors for tailgaters or fire pit fans. What’s great about Anthony’s Cinnamon Toast is that he’s conscious of the mix of warm and cool days, so he’s combining a summer favorite, ginger beer, with tequila, though you can use whiskey or rum if that’s what you have. The Cinnamon Toast name refers to the cinnamon-sugar on the rim of the glass. Pure Autumn and pure delicious! To make maple simple syrup, combine 1/2 cup of maple syrup with 1/2 cup of hot water. Stir to blend. Let it cool to room temperature and transfer it to any refrigerator-safe container. it will last at least one month. 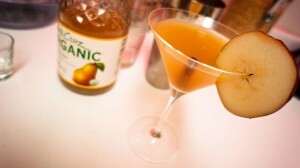 In a cocktail shaker or glass jar with a lid, combine the maple simple syrup with apple cider and lemon juice. Add 1-1/2 oz. of either tequila, aged whiskey or aged rum. Add ice. With the lid on, shake well until "it's too cold to hold." Wet the rim of a cocktail glass with water and dip the rim into your mixture of cinnamon-sugar. Fill the glass with ice. Strain the ice-cold cocktail into the cocktail glass and top it off with a splash of ginger beer. (Anthony likes the Fever Tree brand, but use what you have.) If you want to get snazzy, add an apple slice.